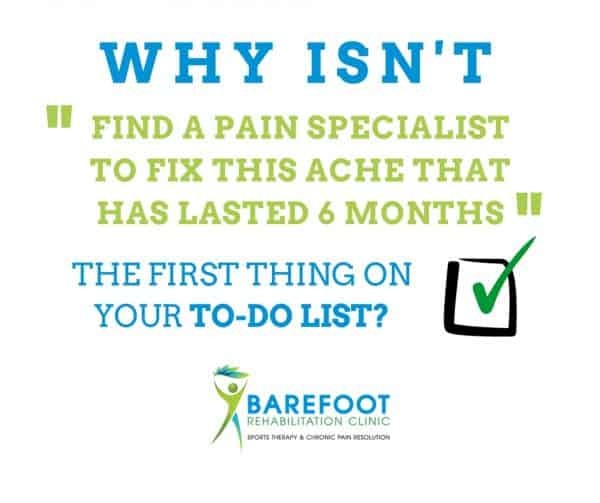 Why Isn't Finding a Pain Specialist the First Thing On Your To-Do List? Home » Why Isn’t Finding a Pain Specialist the First Thing On Your To-Do List? There are 3 major reasons why you put “finding a pain specialist to fix this annoying and frustrating ache that has lasted six months or more” way down on your to-do list, even if it’s there at all. The status quo needs to fail you before you level up to seek out excellence. You love what you’re doing (and ignoring the problem). You don’t realize how bad it might get. Reason #1: You don’t trust doctors. The first time you were in pain, you tried your best friend’s chiropractor. He told you he was going to help you by “letting the power that made the body, heal the body”, then didn’t over 20 adjustments. As your pain grew, you tried a physical therapist. She told you she could fix you with fancy technology such as lasers, electronic stimulation, and strengthening, but failed to. With more and more frustration, you attempted to see your cousin’s favorite massage therapist down the street. You felt amazing for 3 days after the massage, but it came back with vengeance. How many times do you need to see doctors who don’t know how to fix your problem before you seek out a pain specialist? The more times you’ve been failed by doctors or therapists, the more unlikely you are to trust and try a new doctor who promises something different because you don’t realize how that doctor has studied to develop an entirely different area of expertise. I know because I’m a doctor and I don’t trust doctors either. Heck, it was only last year that I started taking my body seriously to drive from New Jersey to Boston and pay $400 per treatment that provides relief and lasts a long time. That’s why I can be pretty aggressive when it comes to Barefoot Rehab’s promise. 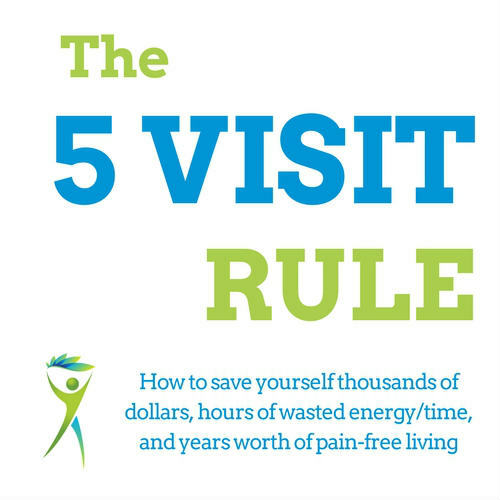 That’s why I never hesitate to tell you about our 5 Visit Rule, where we guarantee some permanent percentage relief within the first 5 visits, no matter how long you’ve had your pain or how bad it is. If you have a problem that can’t be fixed, we’ll tell you before those 5 visits have gone by. It’s so you’ll trust your pain specialist doctors at Barefoot Rehab. Reason #2: You Love What You’re Doing (and Ignoring the Problem). I used to own a CrossFit gym. I was a CrossFitter who loved CrossFit. I loved CrossFit until the pain I was ignoring came too much to bear and I tore my hip labrum. Herniated my low back discs. Slightly recovered from tennis elbow in both forearms. Now, I don’t CrossFit ever. The last time I tried squatting 3 sets of 8 reps at 95 pounds (I played college football and used to squat 200-300 pounds two times per week), my hip was sore for a week. Reflecting over my fitness career, I wish I hadn’t ignored my aches and pains. I wish I had temporarily stopped CrossFitting so I could get fixed and CrossFit over the long-term. 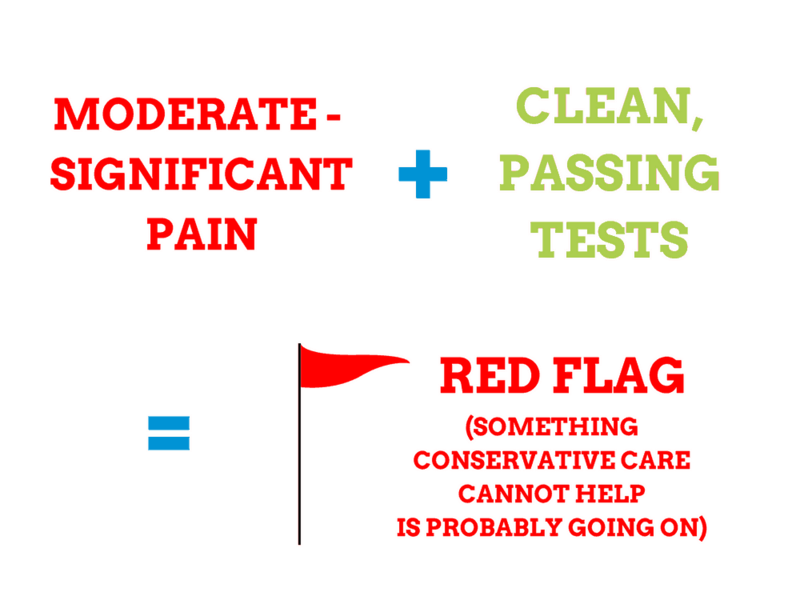 Actively using damaged tissue is not a recipe for permanent pain relief. But we don’t want to stop doing our thing because of #1 (we don’t trust) and we don’t know what or how long will be required to fix it. That’s why seeing a pain specialist who knows how to give you a diagnosis and a prognosis (percentage chance of success) is so valuable, even after an initial visit. Speaking of initial visits, we saw a 14 year-old female rugby player yesterday for her first visit. Nine months prior, she got tackled funny and has had six out of ten mid-back pain since then. Physical therapy has provided no relief and greatly upset her father. Young Patient: I feel better for ten minutes, then the pain comes back. Pain Specialist Doctor (Me): It comes back a little bit or all the way back to six? Young Patient: Back to six. Pain Specialist Doctor (Me): So it doesn’t help at all? Young Patient’s Father: When you put it that way, correct. Along with any new patient’s intake forms, we require new patients bring in any imaging with reports so that we can make an accurate diagnosis. I hadn’t gotten a chance to view the actual images of her spine. When her exam was done and because most of her tests were clean and passing. I asked the female patient to leave her room so I could speak to her father. Pain Specialist (Me): You’re not going to like this. Young Patient’s Father: What is it? Pain Specialist (Me): She has a bone fracture, which is actively pissed off, and a disc herniation. She’s still in pain because she’s continued playing rugby, sports, and exercising for the past 9 months, giving a 14 year-old the disc herniation of a 50 year-old. Young Patient’s Father: Why didn’t anyone tell me this? Pain Specialist (Me): Because Reason #3 in our blog post is that even doctors who don’t know any better don’t know how bad an injury can get. Pain Specialist (Me): At this point, there’s nothing for me to treat. Come back in two months and let’s see where her body is at. Letting a 14 year-old girl play rugby with inflammation inside her bones and discs is an example of poor healthcare for you. I make mistakes and fail patients all the time. But this big miss could cost that girl decades of pain that is unfixable if left to go on its own too long. This girl should’ve been in our office eight months ago. There’s a window of opportunity to get your pain fixed. If you miss it, it could be too late. 1. Finding a pain specialist to fix this annoying and frustrating ache that has lasted six months or more. If you live anywhere far from North Jersey, go find someone on Integrative Diagnosis’s website. If you live in or near North Jersey, our phone number is 862-205-4847. You can trust us to do what’s right by you. You may have to stop doing what you love, but it will be for as short of a period of time as possible, the earlier you get it fixed. The permanent part of your problem will be as small as it will ever be … RIGHT NOW. Then, you get to feel a little dopamine hit as you check off #1 on your list! Are these reasons the same reasons you haven’t sought help for your annoying, frustrating pain? Or is there a different reason not listed here?